The vodka helps to keep the ice cream from getting icy. I used strawberries for these recipes. Pour the heavy cream, coconut cream, sugar, vodka, and orange extract into a deep mixing bowl. Process the mixture with an immersion blender until thoroughly combined and the mixture thickens. Stir in the sliced fruit. Cover the bowl with plastic wrap. Refrigerate the mixture for 3 hours to overnight to let the flavors develop. Whisk the mixture and pour into a large loaf pan, cover and place into the freezer. After about an hour, stir the mixture. Let the ice cream sit on the kitchen counter for 15 minutes before serving. until the berries are incorporated. Pour mixture into popsicle molds and freeze at least 4 hours. To unmold, run under hot tap water for 20 to 30 seconds, and then twist the stick to gently to release. In my area of the world, it is often too hot at this time of year to spend a great deal of time baking when guests are coming for dinner. So during the cooler months, I like to make a few simple sponge cakes to keep in the freezer. That way I can make a refreshing dessert for company in the summer without a lot of fuss. During the summer months, ice cream desserts can really “hit the spot”. It is easy to pull together a really great tasting dessert when it is hot with just a few simple ingredients. Here are a few ideas. 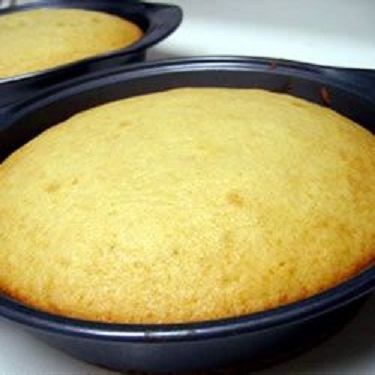 Cut parchment or wax paper to fit two 9″ round cake pans. Separate eggs, putting whites in large mixer bowl and yolks in small mixer bowl. Add 1/2 cup sugar and a pinch of salt to the whites and beat until very stiff. Add 1/2 cup sugar to the yolks and beat until very thick and light yellow in color. Fold flour in using 1//3 cup each time until well mixed. Divide the cake batter and pour into the prepared pans. Bake at 350 degrees F for approximately 30 minutes or until a toothpick inserted in the center comes out dry. Cool for a few minutes, remove from pan and remove paper. In a bowl mix the cake cubes with 2/3 of the coffee until well soaked. 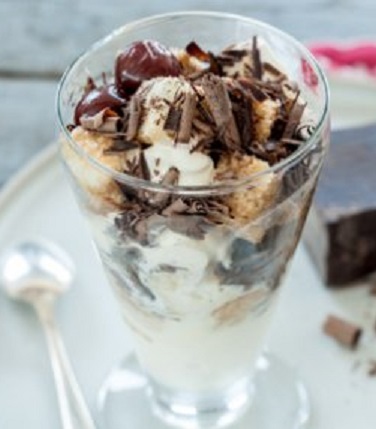 Stir ice cream in a second bowl until spoonable, then layer cake cubes and ice cream in parfait glasses. Top each with a drizzle of coffee, a generous amount of chocolate shavings and a few cherries. Serve immediately. 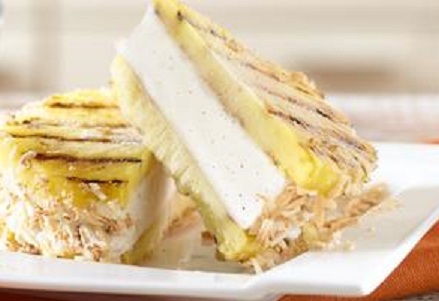 Sandwich the softened ice cream between the 2 grilled slices of pineapple. 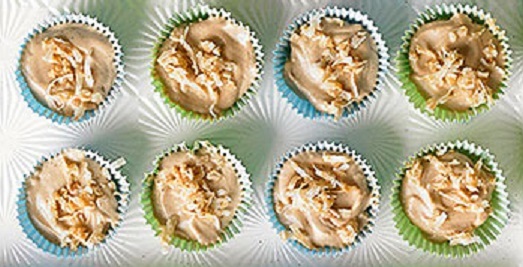 Coat sides in toasted coconut. Slice in half and serve immediately. Affogato is an Italian drink that makes a wonderful alternative to iced coffee on a hot summer day. Affogato literally means “drowned”. 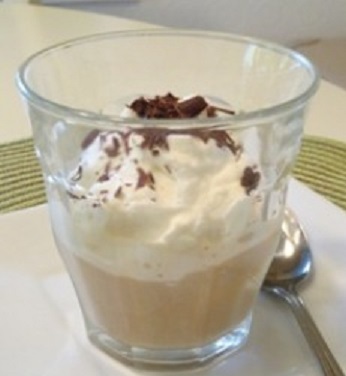 It generally consists of gelato (Italian ice cream) that is topped with hot espresso or a liqueur. You can use freshly brewed espresso or instant or decaffeinated espresso, if you prefer. You may also top your drink with a liqueur such as Kahlua, Grand Marnier or Frangelico. You can also add a little powdered chocolate milk mix to the coffee for a mocha flavor. Traditionally, affogato is served with a biscotti on the side. Beat the cream until stiff peaks form. Stir the espresso powder into the boiling water until dissolved. 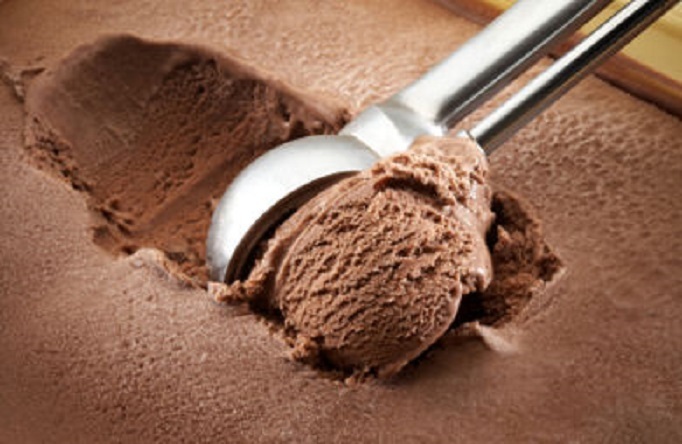 Place one scoop of gelato into 4 tall glasses or large coffee mugs. Pour 2 to 4 tablespoons hot espresso over each. Top each with a dollop of whipped cream and shaved chocolate. Serve immediately. Tip: If you don’t have an espresso maker, use instant espresso powder and water; store the powder in your freezer after opening. Instant coffee will also work in a pinch, it just won’t be as full-flavored. Stir hot espresso and sugar in a medium bowl until the sugar dissolves. Let the mixture cool to room temperature, then pour into a 9-by-13-inch baking pan. Place on a level surface in your freezer and freeze for 2 hours, stirring and scraping with a fork every 20 minutes to break up the ice crystals. Cover and freeze for at least 1 hour more. Beat cream and powdered sugar in a medium bowl with an electric mixer on high-speed until medium peaks form, 30 seconds to 1 minute. Scrape the frozen granita into ice crystals using a sturdy fork. 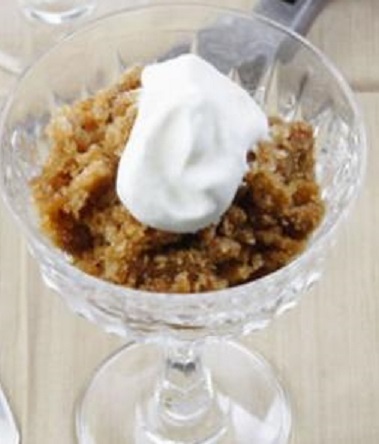 To serve, layer the granita in dessert goblets and top each with a tablespoon of whipped cream. Line twenty-four mini muffin cups with paper baking cups; set aside. Dissolve espresso powder in the boiling water; set aside. In a medium nonstick skillet melt butter over medium-low heat. When butter is bubbling, add coconut. Cook and stir until coconut is toasted and golden brown. Stir in finely crushed biscotti crumbs. Remove pan from heat. Spoon 1 teaspoon of the crumb mixture into each prepared muffin cup; press firmly to pack down. Place the muffin cup pan in the freezer. Keep remaining crumb mixture at room temperature to use for topping. In a medium bowl beat mascarpone cheese with a wooden spoon until smooth and creamy, Beat in the sugar, cinnamon and salt until smooth and well mixed. Beat in vanilla and espresso. Divide filling among the crumb-lined muffin cups. Top each cup with the reserved crumb mixture. With a fingertip, gently press topping into filling. Freeze until firm, about 1 to 1 1/2 hours.